Energy Audits are the surveys and analysis of energy flow in order to reduce the amount of energy input without interfering with the output(s). We can use these to reduce the expense of your energy bill and to leave a smaller carbon footprint, helping our environment. We offer energy audits to both commercial and residential buildings. 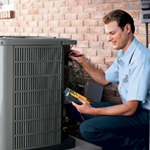 Call Hickman Plumbing, Heating & Air Conditioning to learn more about our energy audit services.